This pretty little building sits on a hill top in genteel suburban Aldeburgh, with stunning views of the coast below. 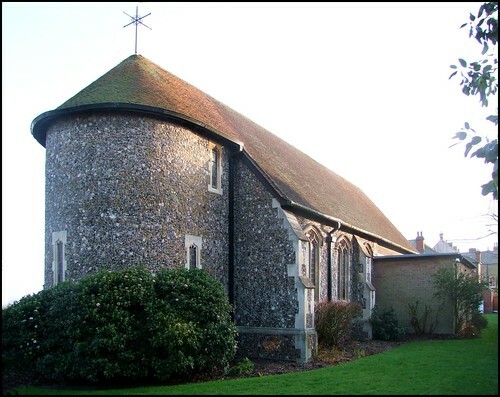 Its flintwork and fortress-like porch make it rather familiar in Suffolk, and it enjoys an apparent High Victorian campness, where Norman lancets in the apse and Perpendicular windows in the nave live together in a jolly proximity. 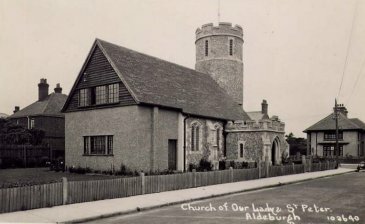 Catholic priests of Aldeburgh ministered at the large church of St Peter and St Paul before the Reformation; but that is Anglican property now, of course, and the Catholic presence returned to Aldebugh in the 1890s. But that was to a temporary chapel ,and this is not a Victorian building, at all. its date of about 1920 gives it a Metroland frisson which is rather thrilling, in a county virtually devoid of such excitement. The Arts and Crafts influenced high pitched roof elevates this building from being merely amusing to an imaginative liveliness worthy of this stylish little town. In fact, it used to look much more conventional. The elegant coving of the roof above what appears to be an apse is not some fancy art deco effect, but an accident of history, as we shall see. Like many Catholic churches of the 20th Century, Our Lady and St Peter is still not complete; the wood-panelled north wall betrays that there were plans for a further extension. The building is aligned north-south rather than east-west, and the porch, in traditional Suffolk late-medieval style, faces east. As you enter it, the table piled high with books and leaflets leave no doubt that this is a Catholic church. But stepping into the nave, you may be momentarily disorientated. That 'apse' is to the right, which intuitively should be liturgically east, and contain the sanctuary; but it is screened off, for use as a sacristy. Instead, you turn left to face the altar. The reason is simple - it is not an apse at all. It is all that remains of a round tower, one of Suffolk's few modern ones. When this church was built, it was intended to be very much in the style of the 40-odd round towered medieval churches that you find in the county, particularly along the coast. 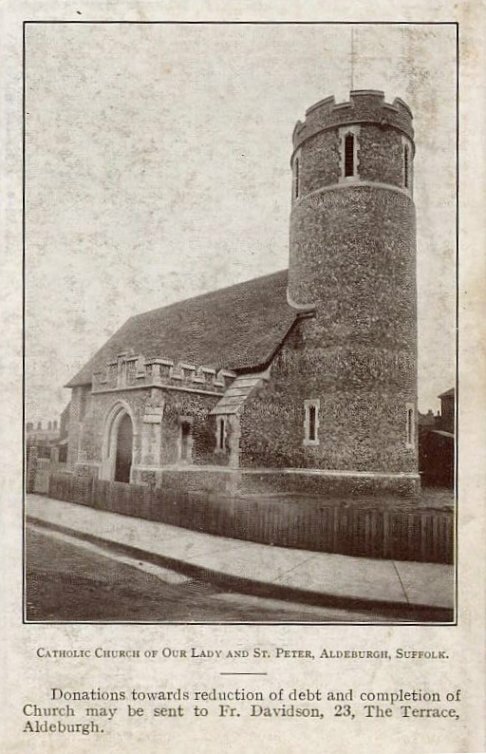 Friend of the site David Whittle sent me postcards that showed the church in its various stages of construction; it was built from the tower southwards, and at one point the south end consisted of what appears to be a wooden cottage-style construction. I'm guessing, but I think it must have been the presbytery. Shortly after the church was completed, the tower was damaged by German bombing during WWII, and had to be taken down. For only a brief while then, this pleasant town had a rather grand little building as its Catholic church, but it is still stylish, I think. Modern chairs face the Comperish sanctuary with its Flemish-style reredos under an arched-braced roof, again traditional in style. The modern stations of the cross are excellent. A small baptistry leads off in the south-west corner, and also forms a chapel of Our Lady of Walsingham. Aldeburgh was, of course, the home of that most Anglican of 20th Century composers, Benjamin Britten. It is not solely the result of the Festival which he created that this town is now second only to Southwold in terms of the percentage of its houses which are holiday homes for outsiders, or for the large number of residents who are also not from Suffolk. I'm glad that not all of Suffolk's towns are like that; but the outsiders, and the Britten influence, give Aldeburgh a very special character, and a High Street full of shops which are absolutely thriving from the visitors who turn the town into a car park in high summer. Residents and visitors alike give the congregation here at Our Lady and St Peter a character all of its own as well. The church is in a joint parish with the church at Leiston a few miles off, and it is hard to imagine a greater contrast than between these two very unalike neighbours. I'm fond of this finely-crafted building, and like nothing better than to cross the quiet road after a visit, walk down the steps to the high street below, and seek out one of this lovely town's old inns.